Last week was a really weird food week. I was in a major food funk. For the first half of the week, I was completely unmotivated to make anything. One night, I walked into the kitchen and just stood in the middle of it. I unenthusiastically opened cabinets and refrigerator doors but just could not figure out what I was in the mood to make and eat. I settled on a banana dipped in pb. Then I curled up in bed and caught up on Girls. I may have had an additional spoonful (or two) of peanut butter before I was done my tv marathon. Maybe… And that was my dinner. Another night, I had some leftover blueberry salsa lying around so I baked a tortilla shell (one of the huge ones) and just ate that and the salsa. Except, there was maybe ¼ cup of salsa left and it was gone before I was even half way through my tortilla. So I just ate a plain, baked tortilla. And that was my dinner for that night. Nothing says a well rounded meal like a plain, baked tortilla covered in sea salt! oh yeah! Truthfully, I think my weird food phrase may have had to do with the weather. I had planned out a menu of grilled items and light salads but then it got cold and rainy. Suddenly, curling up in my pjs, eating a banana and pb for dinner and watching hours of Girls seemed way more fun then trying to get my grill lit for a measly veggy burger..when it’s cold…and rainy. Yuck! Thankfully, the blogs I follow posted some amazing looking food last week and by the time Saturday rolled around, I was ready to cook again! 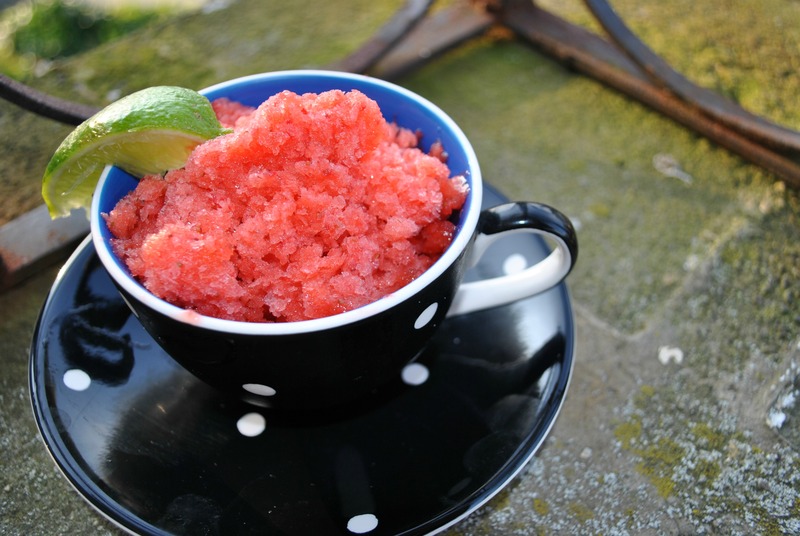 The first thing I had to make was Strawberry Lime Granita that Angela posted over at Ohsheglows.com. We all know that I’m obsessed with lime recently (especially when mixed with strawberry) courtesy of my Strawberry Margarita addiction. For breakfast one morning last week I had hot water with lime because it was 10 degrees in my office, I had no tea and because, well, I’m addicted to limes. I’m hoping this dessert will feed my Strawberry Margarita addiction without me having to reach for the booze. That handle of tequila is disappearing a bit faster than I would like! 1. 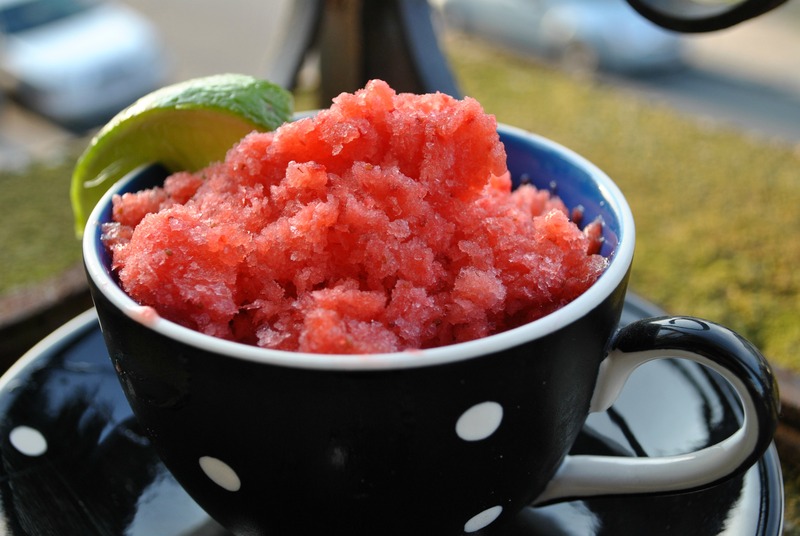 In a food processor, combine all ingredients and process until smooth. Adjust agave or lime juice to taste. 2. Pour mixture into a 9-inch square pan (or equivalent non-stick pan) and place into freezer for a couple hours, uncovered is fine. After a couple hours, scrape the mixture with a spoon or fork to break it up a little. You can repeat this process in another hour. 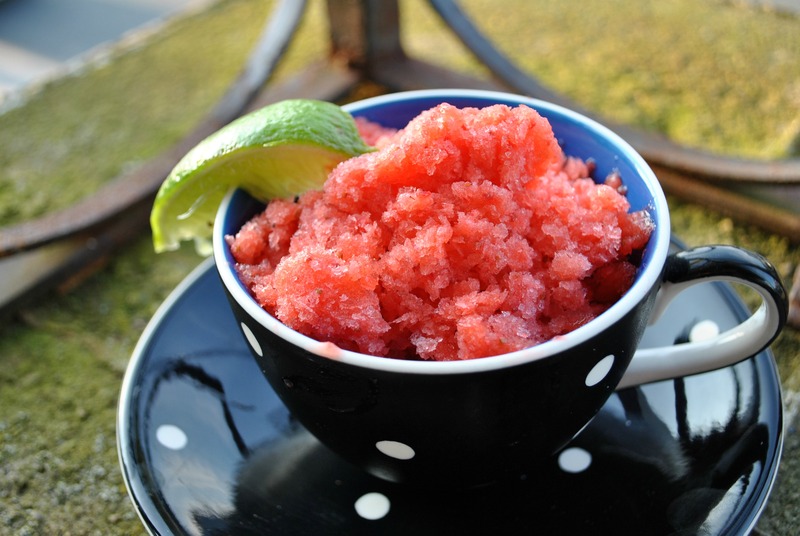 It should be ready after 4-5 hours of freezing, but this may vary based on your freezer. 3. When it’s firm enough, scrape/shave it with a fork or spoon and serve. Cover and freeze leftovers in the freezer until ready to enjoy. 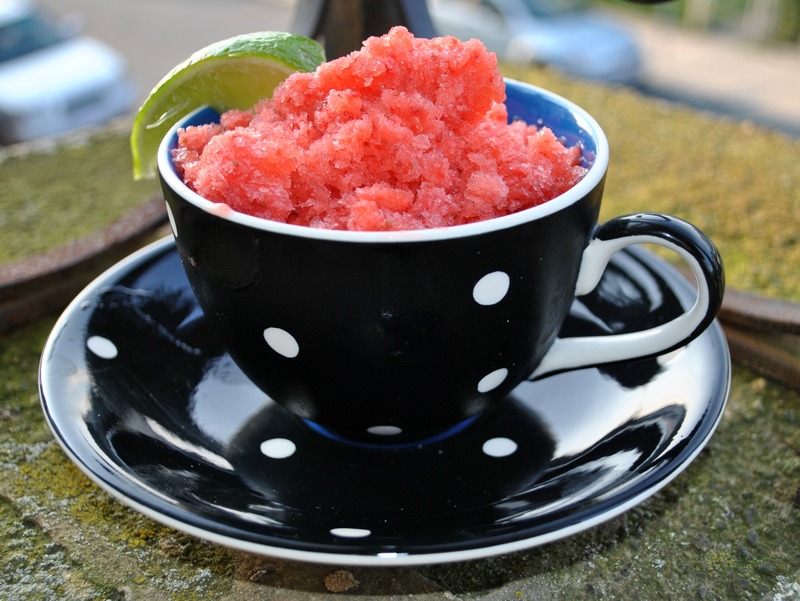 This dessert is perfect for the summer! It’s cold and refreshing but doesn’t have the heaviness of ice cream. Plus, won’t ruin any diets your on. Win all around! Now can someone please tell me what I’m supposed to think of Adam and Hanna on Girls? I can’t decide how I feel about their relationship.